SMCA 2019 Cabaret, Broadway Spectacular, will have some enhancements to our tradition. The event will be held at The Lighthouse Restaurant, 14636 Solomons Island Road, Solomons, MD 20688. The new venue allows us to accommodate additional guests. We have had sold-out audiences for several years and a new space seemed in order. The ticket price will now include dinner, provided by The Lighthouse Restaurant. Non-alcoholic beverages and desserts are also included. A cash bar will be available. Gluten-free food will be an option. Otherm enu details will be posted as they are available. Our ticket price is $60.00 if purchased before Feb. 1, 2019. Tickets purchased after Feb. 1, 2019 are $65.00 . Don’t delay! Musica is excited to have the opportunity for our members to show you additional talents and skills that you don't normally see during our larger performances . Of course, Musica will present group numbers as well. Doors open at 5:30 p.m. February 16. Performance begins at 6:00 p.m. Here is a link to purchase tickets. Please join us! Musica held its second retreat the weekend of August 12 – 14 in Williamsburg, VA. Although the entire group was not able to attend, we did have every vocal part covered so rehearsals proceeded as planned. We were able to rehearse in one of the hotel’s dining rooms, and thanks to a large family reunion convened at the same hotel, we had a built-in audience. We made great progress in learning our winter music, thanks to Kylie’s and Maleah’s excellent leadership. Although there are many fun outdoor activities easily accessible in Williamsburg, the 3-digit heat index made free time spent outside ill-advised. It was necessary to find some place cool. Hmmmm. How about an outlet mall? Or perhaps a wine cellar? Great ideas! 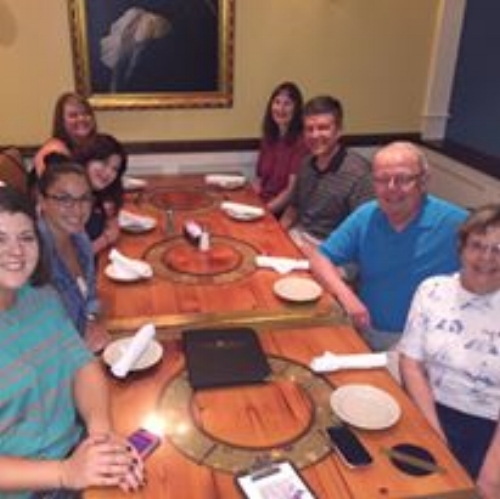 We shared dinner together at Captain George's on Saturday before heading home on Sunday. The retreat is such a fun way to learn music and get to know other members of the Musica ensemble. We will continue this tradition next year, at some place closer to St. Mary’s County so more people can attend.